now that's a FAT wheel! Onto something I actually get. And use. Tyres. I got to have a nice chat with the guy on the Schwalbe stand too, who advised me to try the Durano S tyre for sportive riding…though that may well not stop me opting for the Ultremo ZXs because they’re fast and pretty :). Best road frame in show too, by Ricky Feather. There’s a whole philosophy going on behind it from Rapha Continental. 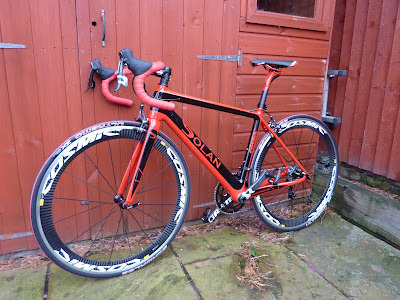 Most people buy their kit to match their bikes…maybe I could buy the bike to match mine? 😉 *grin*. The show seems to have been a success – there were certainly plenty of people there. Hard to be inside looking at bikes rather than outside riding one though – I wonder if the glorious sunshine brought people out to the show or kept them out on the road? Or maybe, like me, they managed to do both in the same day :). This entry was posted in Shows on 26th March, 2012 by Jennifer Trotman.